I was born to a Catholic mother and a formerly Presbyterian father. Neither parent was particularly religious, though both believed in God. When we moved to Utah, Daddy converted us to Mormanism. He really immersed us in the culture in Salt Lake City, and I have only fond memories of the kind, hard-working and very large families that I played with. When we finally moved to Florida when I was 10, Daddy dabbled with several churches, but we essentially stopped going. When we did, it was sporadic and halfhearted. I suppose because I never really knew my mom’s side of the family in my early years, and only vaguely remember a Mass in Latin, it held some kind of allure for me. It was exotic with the incense and wine and candles. I was told that my grandma didn’t like cards because they were evil, which I found strange since my Dad’s family always played cards. What I couldn’t stand was intolerance and hypocrisy. I thought the crying preachers on TV were offensive, and I never really believed in HEAVEN and HELL as I was taught. After my divorce, when I was about 22 or so, I converted to Catholicism. It was important to me that my children were christened in the church. Dad always told me that if you believed in God and He didn’t exist, you lived a good life, but if you didn’t believe & He did exist, you were in big trouble. Maybe that’s the wrong way to look at it, but it seemed to make sense to me. I loved the Catholic church. I loved the long Mass and the singing and the fact that no matter which church you visited, you knew the words. I loved the Confessional, and I loved the church looked. 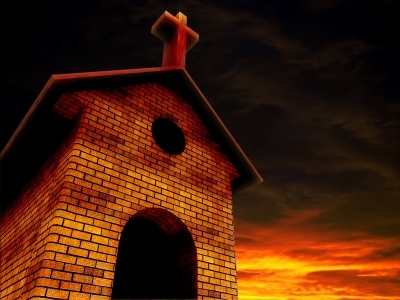 I never felt connected to Protestant churches the way that I did in the Catholic church. Surely, God would live in a Catholic church if He were at any church. My first blow to my faith came when I met my current husband. Without going into details, suffice it to say that he was not “acceptable” as a spouse as far as the Church was concerned. My feelings for the man that I feel for were so deep and true that I knew that God made us for one another. I gradually stopped attending services as we got closer to one another. The next and final blow came when my sister committed suicide. The church can forgive most anything: murder, adultery, even an abortion if you express penitence, BUT NEVER SUICIDE. The problem was, I just did not feel that Heather, after living a Hell on earth, was being further victimized in an imaginary place called Hell. I could feel her. I could sense that she was ok. Perhaps it was just my imagination, but she visited me in a dream, and she was happy. That was the end of church for me. After Heather’s death, I did a lot of thinking and reading about God. I studied Buddhism, spoke with my Jewish friends, read about Hinduism, studied Paganism and Wiccan religions, and finally settled on my own beliefs. I believe in God as an ever-pervasive spirit and intelligent being. I believe that God is like a collective unconscious and that we are all connected as living beings. I believe that science has proven that we are energy and the first lesson we learn is that energy can never be destroyed, only change form. That is what I believe happens to us and every other being in the world. I believe that the church (insert religion here:______) was developed as a means to control society, and in most cases, is weighted heavily toward the dominance of men over women. I believe that we have the personal power in our lives to get anything we want simply by asking and believing, and that the church wants desperately to suppress that personal power because it will diminish the power of the church. Finally, I believe that at the base of every religion is the Golden Rule: “Do as to others as you would have them do unto you,” “An it harms none, do what ye will,” “What is sent out, comes back,”…in other words, KARMA. I did not intend to delve into religion. That is such a hot button issue, and frankly, a personal decision. I expect no converts, nor do I wish to insult or diminish another’s choice. This is simply what I have come to believe. Next Post The Weekend Is Never Long Enough!